SALT LAKE CITY — A new reality show coming to The Learning Channel (TLC) tonight will feature a Utah polygamist and his five wives, with whom he has fathered 24 children. 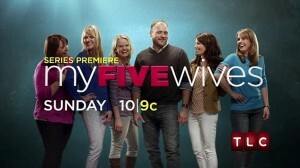 My Five Wives will follow the life of Brady Williams, 43, and his wives Rhonda, 43, Paulie, 41, Robyn, 40, Rosemary, 40, and Nonie, 35. Williams is married to Paulie, and the others co-habitate with Williams without marriage licences. Each have conceived a range of four to six children with Williams. “When I married Brady, I still had it in my mind that, that was how I was going to make it to heaven was by living in a plural marriage situation and I wanted to make it to heaven,” Rhonda told reporters. Williams, a former Mormon, joined the Apostolic United Brethren (AUB) for a time, but states that he no longer belongs to any religion. “There shouldn’t be the fear of hell or the promise of heaven,” he told television station KUTV. According to reports, Williams’ wives live in two separate homes, and each night he stays with a different woman. Cameras followed Williams and his wives for three months, recording their interactions, including inter-“family” disputes and rumors of pregnancy and adoption. “We’re just like any other family, just on a bigger scale,” one of the women states in the trailer for the broadcast. Similar to the reality show Sister Wives featuring Kody Brown and his four wives, My Fives Wives Seeks to gain acceptance and tolerance of the polygamist lifestyle. “[I]t’s important to stand up for what’s right. And it’s right to allow consenting adults who are well-adjusted and not coerced to be able to share their lives and raise their children in a stable and loving environment,” Williams told the Salt Lake Tribune. But others have stated that promoting polygamy is far from “what’s right”—especially in the eyes of God.